House Speaker Shap Smith and Senate President Pro Tem John Campbell file into Gov. Peter Shumlin's office Friday afternoon. Vermont legislative leaders remained on a collision course with Gov. Peter Shumlin late Friday as they neared a tax deal at odds with his demands. Shumlin has spent weeks urging the House and Senate to trim their budget proposals and ditch income and sales tax hikes he opposes. But after a long day of closed-door meetings throughout the Statehouse, legislative negotiators unveiled a $30 million tax package at 10:30 p.m. that did not appear to meet with his approval. 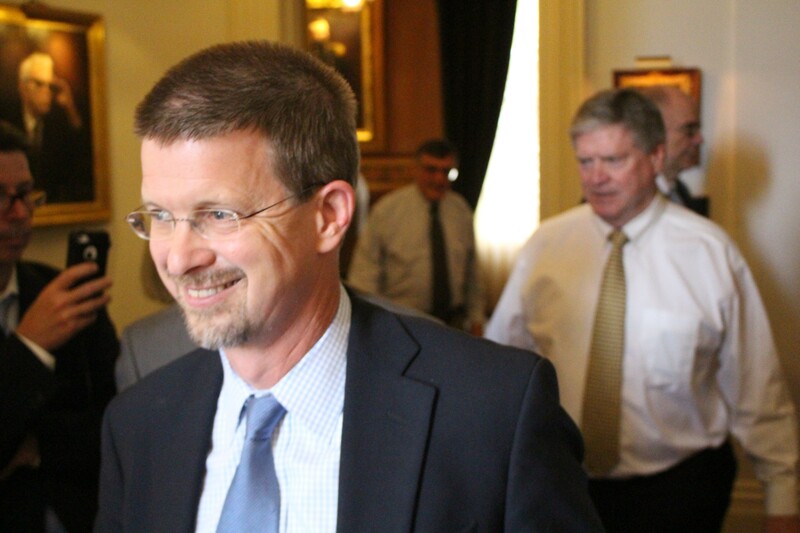 Asked if he expected Shumlin to veto the plan, House Speaker Shap Smith (D-Morristown) said, "You know, I'm eternally optimistic, but perhaps it is unwarranted in this instance." The governor himself remained out of view Friday, hunkered down in his ceremonial Statehouse office for much of the afternoon and evening. Members of his staff roamed the Statehouse halls but did not appear heavily engaged in deliberations with legislative leaders. The governor's spokesman, Scott Coriell, said he would not comment on the plan until Saturday. Shortly before midnight, a House and Senate conference committee signed off on next year's $5.4 billion budget. Those charged with finalizing the tax bill and a health care bill left the Statehouse for the night without formally agreeing to either item. But Smith said he believed the legislature might still meet its goal of adjourning Saturday night. In recent days, Shumlin has come out swinging at proposals to limit itemized income tax deductions. But the chairs of the legislature's two tax-writing committees, Rep. Janet Ancel (D-Calais) and Sen. Tim Ashe (D-Chittenden), nevertheless decided to cap such deductions at two times the standard deduction, or roughly $25,000 for couples filing jointly. Under the plan, which would raise $10.5 million, taxpayers could still deduct charitable contributions and medical expenses. By excluding the latter two deductions, Smith argued, the legislature was trying to meet Shumlin halfway. "I think, actually, we've responded to a number of concerns that the governor expressed, particularly around the health care and charitable deductions," he said. "And so my hope is that, in addressing those things, we can move closer together." The plan would raise another $15 million by closing a loophole that allows taxpayers to deduct their previous year's state and local tax bills. That provision was initially recommended by the governor. The plan would also extend the 6 percent sales tax to soft drinks and the 9 percent rooms and meals tax to vending machine food. Shumlin opposes the soda and vending machine taxes. Asked if she was worried she was courting a gubernatorial veto, Ancel said late Friday, "We're trying to get a revenue bill and trying to get out of here." Ashe said he was less concerned about risking a veto than finding a bill that would satisfy his fellow legislators. "We arrived at what we thought was a fair way to raise the money and that we could reach agreement with the House," he said. Ashe said there was "no easy way" to raise the money he needed to "unless you find the money-farting unicorns I referred to earlier in the year." But, he noted, such unicorns are "still elusive."